A non-profit trust hopes to restore a classic downtown theater as a concert hall. Wisconsin Ave. theaters in 1933. Courtesy Larry Widen collection, photo by Albert Kuhli. There was a time, back in the first half of the 20th century, when downtown Milwaukee was the main place to watch movies and live stage acts. 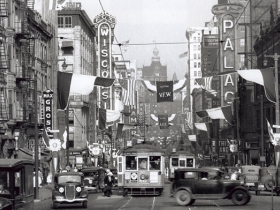 If you walked six blocks down Wisconsin (then called Grand) Avenue between 1900 and 1932, you would encounter epic structures with giant vertical blade signs touting such names as the Alhambra, the Palace and the Majestic. On connecting blocks to this main strip, there were dozens of smaller but just as ornate theaters like the Princess and the Toy. During this timeframe, more than 85 theaters were built in the city and then sometimes demolished to build an even better theater. Today, just one of those theaters—the Riverside—is open as a venue for touring shows. Another large-scale movie theater structure still stands at 212 W. Wisconsin Ave. 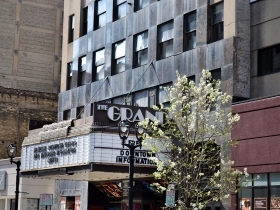 Originally called the Warner, it opened as an elegant flagship for the Warner Brothers’ chain in Milwaukee but would close as a forgotten split-level cinema called Centre and then the Grand. 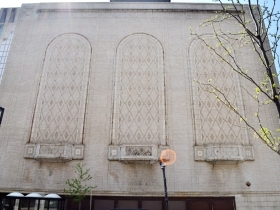 The entire 12-story, Art Deco office building has remained dormant and the French Renaissance-inspired auditorium sealed like a tomb for almost two decades. There have been very few inquiries into buying or leasing the Centre Building and one serious look by the Milwaukee Symphony Orchestra in 2001, which has long had some interest in finding its own concert hall (it shares the Marcus Center’s Uihlein Hall with other tenants). Even though acoustic tests at the time conducted by Altec proved the quality to be better than at Uihlein Hall, the venture seemed too costly and complicated at the time. Warner Theatre lobby. Photo by David Heaton. Over the next few years, if concert conductor and music director Myron Heaton and his Grand Warner Theatre Trust can accomplish a series of feats, the 2,400-plus seat theater could reopen in a few years as a rehearsal and performance space for local performing arts with music at its heart. The rest of the building could be used for the arts organization’s offices with living spaces for visiting artists. It’s even possible it could still be a performance venue for the symphony. 2nd St. & Wells St. site. Photo by Brian Jacobson. Nonetheless, Heaton’s group faces a laundry list of issues before the project can come to fruition. Put simply, all that his non-profit trust must do is complete a charter (this was completed in May), lobby for national historic registry status, consult with interested arts organizations on how the building could be converted to meet their needs, make a presentation to a network of foundations, philanthropists, grant writers and benefactors, look into a low-interest loans, find a partner who will help build an eight-story parking structure and active annex on the under-used lot along the theater’s 2nd and Wells Street side, purchase the land at 212 W. Wisconsin Ave. from two family trusts that have held the deed since 1921, buy out the lease from Marcus Realty (which runs until 2021) on the building, and finally conduct asbestos removal, restore the intricate lobby and auditorium, bring electrical work up-to-code and most importantly, deepen the stage. 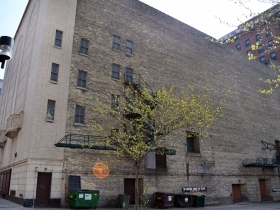 The Milwaukee Downtown Newcomer & Visitor Information Kiosk, which now leases the original ticket booth and marquee space in the building from Marcus, would also have to move (next door in the connected empty storefront, for example). A final price tag for all this is estimated at $40-60 million. Purchasing just the building and land is the current task at hand, Heaton says, with renovation and expansion of the theater coming later. Funds would come through various means, including matching donations from some already willing foundations, he notes. Warner Theatre. Courtesy Larry Widen collection, photo by Albert Kuhli. Each step of this process can by itself be complicated. The land the theater sits on, for instance, is owned by Iron Butterfly LLC, which is held by Paul Bielich (who wants to sell the land) and his two sisters (who are reportedly not as eager). Bielich also wants it to be a historic registered place, (that’s one of the things that has saved the building, Heaton says) but other parties reportedly do not. And there is another family that owns roughly half the land under the building’s storefront of about 30 square feet. There may even be some dummy corporations based in Arizona that have some ownership. Still, projects this complex have been accomplished before, both in Milwaukee (the Milwaukee Repertory Theater’s complex was a comparably major project) and most notably for the Hennepin Theatre Trust—which is the model and somewhat adviser in making the Grand Warner project happen. In the revitalization of downtown Minneapolis as a central location for the stage arts, four distinct theaters were saved from demolition. It’s a daunting project. If any number of steps listed above falter, the Grand Warner Theatre Trust may not be able to move forward and the project is over. Myron Heaton and John Lettermann. Photo by Brian Jacobson. 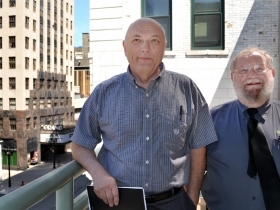 Still, in an interview with Urban Milwaukee, while overlooking the site from a second-floor outdoor patio, Heaton and his partner John Lettermann were optimistic due to the amount of ‘yes’ and support they’ve received in the past three years so far. How do they keep hope alive against the naysayers? “We’re singers,” offers Heaton with a wry smile. “More specifically, we’re tenors,” Lettermann laughs very deeply. The Warner Theater was built in 1930 on top of the now-folkloric Butterfly Theater and several other buildings, which explains some of the odd land ownership and the Iron Butterfly LLC name. The lavish five-story auditorium was meant to be enthralling to draw in crowds, and the $2.5 million movie palace—the last of its kind to be built in Milwaukee—was dedicated on May 1, 1931 in a spectacle that briefly lifted the city from the depths of the Great Depression. Archived Milwaukee Sentinel newspapers reveal the major coverage of this night in great detail: civic leaders like Mayor Dan Hoan, Police Chief Laubenheimer and Sen. Bernard Gettelman attended, while Governor Bob La Follette recorded an early “talkie” congratulating the Warners. Valets parked cars in a private garage built for the Warner. A full staff of maids and ushers waited on attendees in the mirrored lobby and lounges while a string orchestra performed near bubbling fountains. Outside, police linked arms to hold spectators back as Hollywood starlet Bebe Daniels arrived late. Kleig spotlights searched the sky while a hired airplane buzzed the area. 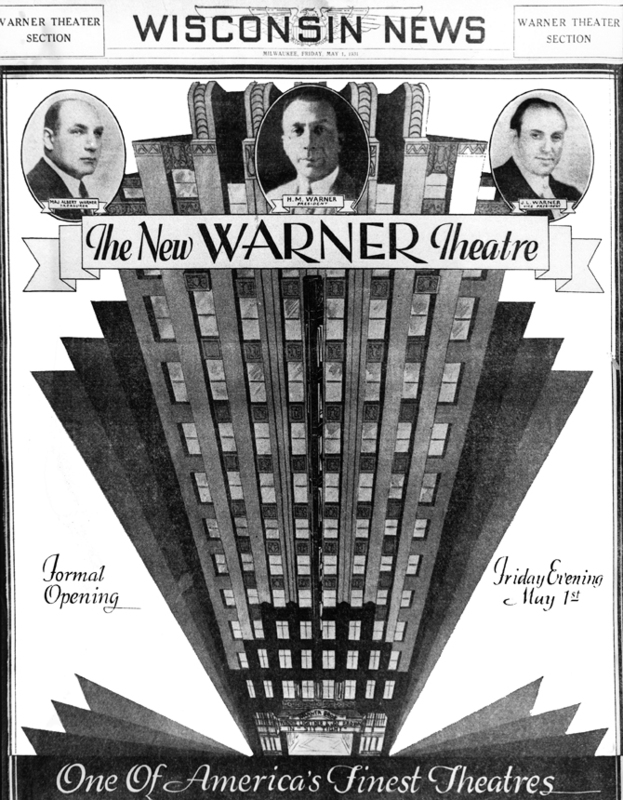 Warner Theatre opening advertisement. Courtesy Larry Widen collection, photo by Albert Kuhli. Larry Widen, who literally wrote the book (several editions worth) on “Milwaukee Movie Theaters,” tells a story that the great photographer Albert Kuhli related. He had been hired by the Warner Brothers to take staff and beauty shots before the opening, and then again as a ‘Press’ photographer the next night and they wanted him to continue putting on a show even if no photos resulted. “They told him, we don’t care if you don’t have any film in your camera, just pop off some black powder once in awhile,” Widen relates. One of the proud features of the Warner was a 3-manual, 28-rank Kimball organ which was played before shows and became a staple of WTMJ radio broadcasts on Saturday nights. 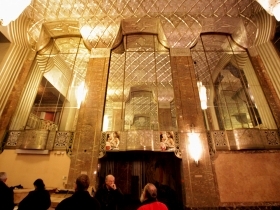 While most of the organ ended up at the Oriental Theater and some of the bubbling display fountains are missing, much of the theater’s architectural features and murals are surprisingly intact. The theater’s golden years lasted until the 1960s. The growth of residential suburbs, shopping centers and then movie multiplexes increasingly drove away the audiences for downtown theaters. 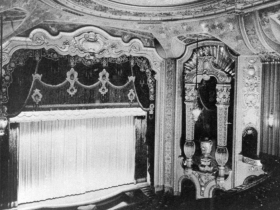 Once epic movie palaces like Fox’s Wisconsin Theatre responded in 1963 by splitting its screening rooms down the middle and installing a (faux) Cinerama experience. It was finally demolished in 1986, on land now occupied by the Delta Convention Center. Across the street, the once-great dance hall and vaudeville circuit Palace-Orpheum installed real Cinerama as a feature until the fad waned. Eventually the theater started to lose its luster and returned to live stage shows until it was demolished in 1974. 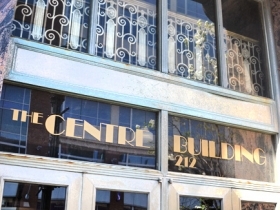 Centre building signage. Photo by Brian Jacobson. In 1966, Ben Marcus added the Warner to his burgeoning moviehouse chain. The vertical blade sign was taken down and the place was re-christened as the Centre Theatre. By 1973, it became Centre Cinema I&II—split vertically (at the balcony line) into upper and lower screening rooms. Then in 1982, it was re-branded Grand Cinema I&II to mark the opening of the new mall across the street. By the late 1980s, the movies were mostly urban or action. Major League and Fair Game had their premieres at the Grand, shortly before it shuttered in 1995. Back in the 1970s, The Riverside still ran Z-grade action movies, but the building itself was falling apart. Heaton would regularly sneak into the Riverside with friends to play the once-prized-but-now-raggedy pipe organ. They would ask the custodian where the chandelier went and he would show it to them lying in storage. Eventually, they got to know every last corner and feature of the place until the gang decided to lobby Joseph Zilber and Towne Realty to save the organ and refurbish the venue. Work took Heaton away to Las Vegas before he could join the committee that made the final pitch to Zilber, but Heaton carried the preservationist spirit along when Bob Dylan and his brother David Zimmerman were thinking about tearing down the historic Orpheum Theatre in Minneapolis. Heaton did historical research on the site for what would become the Hennepin Theater Trust, and later he did other work with a group acting to save the city’s Shubert Theater from demolition. In that case, the entire building was moved two whole blocks in dramatic fashion. Warner Theater (now known as the Grand Theater) front entrance. Photo by Brian Jacobson. During his many enterprises, Heaton would return home to Milwaukee to visit family. On one of these brief stays, he took a walk down Wisconsin Avenue and was shocked to find the Warner — which he had been told was torn down — still standing. Heaton now has primary residence in Milwaukee and the gears of the project are starting to turn. While a Milwaukee Journal Sentinel story suggested the symphony could be interested in locating a new concert hall at the proposed Couture building, symphony insiders say this is quite speculative. The Grand Warner location might still be in the running. Other groups, like the Milwaukee Ballet, the Bel Canto and the Florentine Opera, might also be possible tenants. Many of the elements are now right for the trust’s venture: new hotels and apartments surround the building. Even if a parking garage/annex cannot be fully realized, there are parking structures within one block in every direction. 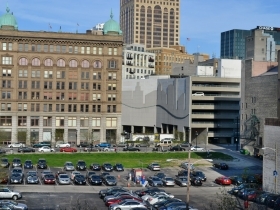 The convention center, just two blocks away, draws hundreds of thousands to the downtown area every year. The Milwaukee Film Festival could potentially host a premiere there. And the entire effort could complement the mayor’s effort to revive Wisconsin Avenue. Widen is skeptical the whole project will work, given the challenge of rescuing old movie palaces and the frugality of Milwaukee residents. Still, he still sees its allure. Spent a lot of time at The Warner/Centre/Grand while managing theaters 17 years for the Marcus Corp. I would love to see it open and restored. From the photos alone, I’m willing to toss in a few dollars. May not be much, but it’s true: we just simply do not build grand spaces like this much any more. The place looks like it could be beautiful. My preferred venue for music and other acts is are the Pabst and Riverside, and adding another option would be fantastic. Maybe someday the folks that run the Rave will realize what they did to that place, and restore it (not holding my breath). Fascinating. Would love to see this happen. It’s true, theaters like this simply aren’t built anymore. 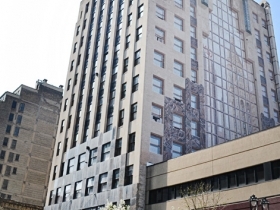 Why not save an old gem and breath new life into Wisconsin Ave.
8 story parking structure? Rather see that lot developed into something else. There seems to be many many structures already south of Kilbourne and north of Michigan…..yay…more convinient parking so people don’t have to walk past potential future businesses. @Casey, Yeah I’m not soo hot on that part of the plan either. The main focus of that space would be the annex–the first two stories of the structure. It would be used as rehearsal space, a scene-building shop, and other things. As for the parking–the fact of the matter is that people from SE Wisconsin will not come downtown unless they can park…they hope for free. I don’t like it either, but it may be necessary to make this work. My hometown, Cleveland, OH., is a similarly small city and they saved five theaters from the twenties from the wrecking ball. 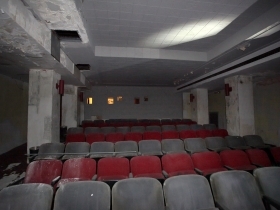 Two of those theaters were in exceedingly bad condition. They are all open and thriving financially now under the name of Playhouse Square. Buildings of this type simply cannot be replaced. We no longer have the artisans capable of doing it regardless of cost. When such art is demolished, it is gone forever. I only ask that those in charge TRULY consider the results of their actions. It’s high time people from SE Wisconsin learn how to walk a couple blocks. Ridiculous to think that there’s multiple parking structures within blocks that could be utilized to serve the space, yet there’s plans for a multi-story dedicated parking structure. It’s a waste of money, space, and resources. This “park for free” mentality has to change. It’s keeps good projects from moving forward while killing walkability and street life. It’s also far from “free” for anyone. Kahler Slater + Mayor Barrett + 8 story parking lot = FAILURE !! Find a new architect, don’t listen to Barrett’s ideas, and realize that there is plenty of parking already down there. One structure across the street on 2nd, three structures between 3rd and 4th and let us not forget that GRAND AVENUE MALL HAS PARKING STRUCTURES !!! Using those parking spots sure the HECK WOULD HELP OUT A DYING MALL. The property on 2nd and Wells should be developed for residential use. Hopefully Kahler Slater won’t design another gawd awful looking building. I sure am glad the majority of readers agree that there is far too much subsidized parking downtown which is hurting it but does the mayor and alderman (bauman?) know who the people feel? No one likes walking across the parking lots and the blind driveways. If there NEEDs to be a structure there should at least be retail/offices on the first floors. it is incredibly beautiful and should be sued, now figure out how to do that. there is beautiful theater in West Allis I have looked at for years and tried to figure out how to use it. We should prsevere some of our history like europe. If we continue eradicating these cultural and historical landmarks, we show disregard for not only our city’s heritage but the future as well. I don’t want to tell my kids or grandkids, “Oh, a historic building was there… but that parking lot sure was needed to make our lives easier.” Hindsight almost always prompts us to ask why the decision was made to raze a structure. I only wish we could enter the Pabst building on Water, go to a concert at the Unicorn, enjoy a beer in the remodeled Gipfel Union Brewery… and see a show at the Warner. Also, wouldn’t it be nice if the affluent Marcus Corporation took an active role in rehabilitating the facility? What are they gaining by having it sit empty? @Casey, I completely agree. I work on 2nd and wells and see nothing but parking structures. Another just seems pretty unnecessary. Came to Milwaukee 5 years ago from Nevada. I had someone at the door park my vehicle for me for a buck. I come here and have to pay $20 to $30 to go to anything downtown. That’s the cost of a plate at a decent restaurant. now, do I want to support local, vibrant businesses or the folks gouging me to park? I consider that a no-brainer. Granted, the excuse I’ve heard is “you should see what it’s like in Chicago”. Yeah, well, this ain’t Chicago, it’s Milwaukee. And Milwaukee has a good reputation in spite of its proximity to The Windy City. I am a retired electrician and would love to volunteer my services as long as the ownership of the theatre is a non profit corporation. The theatre is beautiful inside. Current owners cannot take care of the building and never will be able to. I incourage them to “let it go” to people who have the passion necessary to do all the work necessary for the preservation.